Our Canadian winters are a defining feature of our culture. Our winter weather is often also hard to predict. Frigid temperatures and snow accumulation can be just as likely as ice storms and unexpected periods of rain or hail. When a winter storm strikes, it is important to take extra precautions in your daily travels as well as at home. Storms can make the roads dangerous. Drivers should strive to take extra caution on the roads or avoid driving at all if possible. Additionally, wind chill can pose a particular risk to people who are outdoors for extended periods of time in the cold. Wind chill is the effect of wind blowing across exposed skin, which pulls heat away from our bodies. A 15-mph wind can feel like -20 degrees F (Wright, 2018). At these temperatures, frostbite can occur in as little as 30 minutes. Given the potential dangers of a winter storm, taking these two precautionary measures for your home will allow you to stay safe indoors while it passes. Precautionary measure #1: Have a home emergency kit. A home emergency kit should have a few key items with enough stock of each to last you and your family three (3) days. In the case of a power outage, you will not be left without lights or resources. Here are a few essentials for your emergency kit. Flashlight and extra batteries. When considering the life of your batteries, know that extreme cold can impact their performance. Cold batteries drain faster than warmer batteries, so do not leave them in unheated sheds before usage. Some people prefer to keep candles on hand. Food and water. Collect food stuffs that will not spoil in the event that your fridge stops working. This can include energy bars, dried foods, or canned foods. Don’t forget that you will need utensils, plates, and a manual can opener as basics for fine dining during the storm! For water, ensure that each person in your household has two litres of bottled water per day, plus extra for cleaning purposes. First-aid kit and necessary medication. If any accidents or injuries do occur during the storm, having these supplies on hand will be invaluable. It is also important to ensure that anyone in your family requiring medication has access to a ready supply that does not require going to a store. Warm clothing and blankets. Everyone in the house should be able to bundle up in case you lose power to your heating system temporarily. It might be helpful to have sleeping bags, warm blankets, and thick coats, to name a few key items. If you have a battery-operated radio on hand, that will also allow you to listen to news broadcasts of what is happening in your local area. Precautionary measure #2: Maintain your home’s exterior. Strong, blowing winds and freezing ice can damage your home’s exterior if the area is not well-maintained. During the spring and fall seasons, be sure to cut tree limbs back away from your house and remove any dead branches. If you have trees near your home, your gutters may also need to be cleaned regularly. Keeping the gutters free of debris and downspouts directed away from your home will prevent melting snow from pooling around your home’s foundation. Check your home’s roof as a necessary fall to-do. Are the shingles damaged? Is your gutter askew or falling off? Is your chimney in good repair? These are all important maintenance questions to ask. An average roof can handle up to four feet of fresh snow before it’s too stressed (Wright, 2018). We always hope for calm and uneventful winter weather – but it is incredibly valuable to always be prepared! At Applewood Air, our HVAC expects can help answer any questions that you may have about preventative maintenance for your home’s heating and cooling system. 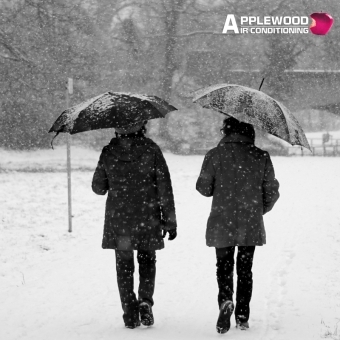 Call us here at Applewood if you have questions about your complete home comfort! We can be reached toll-free at 1-800-487-7307.